A brass band musician in New Orleans leads a dual life. One moment, he is an icon celebrated for upholding a proud tradition, and the next he is a faceless black male subject to poverty, racial marginalization, and urban violence. 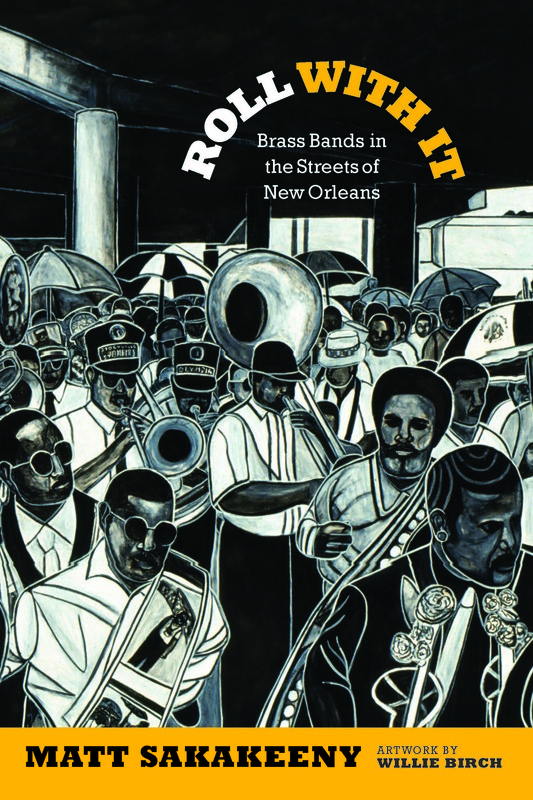 Roll With It: Brass Bands in the Streets of New Orleans follows musicians as they mobilize across these two sides of the same coin. Marching alongside members of the Rebirth, Soul Rebels, and Hot 8 brass bands, readers are transported to the streets and nightclubs where horns and drums propel audiences to move and dance.There are also encounters with aggressive policing, exploitative economies, violent crime, and a political infrastructure that creates insecurities in healthcare, housing, education, and criminal justice. The story culminates with the killing of two musicians who are memorialized with a jazz funeral as well as with new compositions that draw upon hip-hop to voice the particular experiences of black Americans in the post-civil rights period. Based on interviews with musicians, observations of their performances, and collaborations on public programs, this story about feel-good dance music is also a commentary on precarious lives at the start of the twenty-first century. Roll With It will be published by Duke University Press in November, 2013.